The Cairngorms are a vast range of mountains in north-east Scotland. They are said to be the nearest Scotland has to arctic tundra. 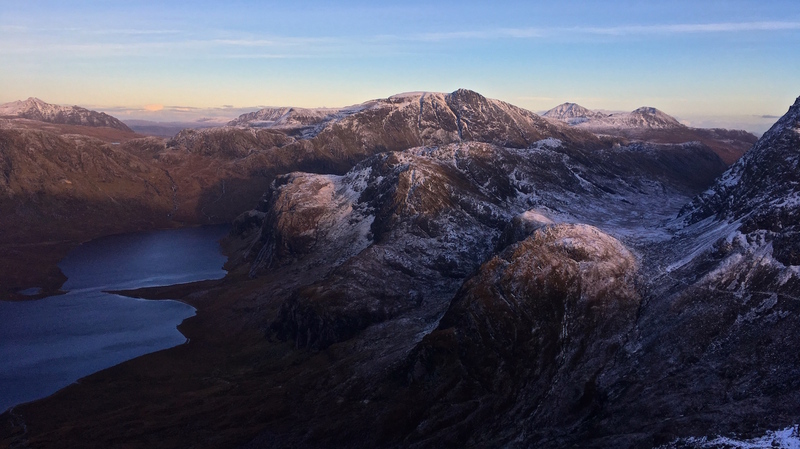 With 5 peaks over 4000ft, these are high hills with vast open spaces across endless plateaux and grand corries sculpted during the last ice age. The approaches to these hills are through some of the largest remnants of the native Caledonian pineforests and both the low ground and the high summits are home to some of Scotland’s most iconic wildlife such as red squirrels and golden eagles. In the summer time there is even a reindeer herd that can often be seen roaming the tops. This trip explores this amazing landscape from the north and aims to tackle some of the area’s more well known summits. The proposed itinerary for the trip is outlined below with brief descriptions of each of the walks. Starting from near the Scottich National Outdoor Training centre at Glenmore Lodge, a scenic walk through the Ryvoan Pass leads onto a right of way leading south through the mountains to Braemar. This path is followed onto the high ground before striking off to tackle the final summit cone of Bynack More. The descent from the summit leads past the Barns of Bynack, a jumble of incredible tors of granite strewn across the mountain’s upper slopes. After crossing the subsidiary top of A’ Choinneach it is an easy descent to The Saddle just above the shores of the remote Loch Avon and at the head of Strath Nethy. A steep ascent gives access to the summit of Cairngorm with stunning views out over the plateau and down to the pinewoods of Rothiemurchus Forest with Aviemore in the distance. The return will be down Coire na Ciste where a network of paths are gained through the woodlands back to Glenmore. This day tackles 3 Munros right in the heart of the Cairngorm massif. Beinn Mheadhoin even translates from gaelic as Middle Hill. The route takes advantage of the access offered by the ski centre infrastructure, starting at 640m and follows good paths below the northern corries of Cairngorm and onto the plateau near Lochan Buidhe, the highest named lochan in the UK! From there it is a gradual climb to the summit of Ben Macdui, the 2nd highest of the Munros. Descending from here, following the spectacular rim of Coire Sputan Dearg, leads to an easy ascent onto Derry Cairngorm. We then retrace our steps northwards and descend to Loch Etchachan. This gives access to Beinn Mheadhoin which has a little easy scrambling to reach the true summit on top of a massive granite tor. The return is via Shelter Stone and the Loch Avon basin, with one final climb to cross the plateau near Cairngorm and descend back to the ski centre. A classic big day out in the high Cairngorms tackling the 3rd, 4th and 5th highest Munros. Starting from the Sugar Bowl Car Park the route follows a well built path westwards below the northern corries of Cairngorm, through the Chalamain Gap and into the Lairig Ghru. Just before entering the Lairig Ghru proper, a path branches off west and climbs steadily over the top of Sron na Lairige and up to the summit of Braeriach, perched right on the edge of the massive cliffs of Coire Bhrochain. Pleasant walking from here leads out over the vast and featureless plateau past the source of the River Dee and round the head of Garbh Coire, home to one of Scotland’s only near perennial snow patches. After a gradual descent it is a short climb to the shapely summit of Angel’s Peak, and then only a little further to the summit of Cairn Toul. From this last peak, a steep descent leads down to the famous Corrour bothy leaving a long walk through the historic pass of the Lairig Ghru back to the Chalamain Gap and the path back to the Sugar Bowl.